Today I felt way better than yesterday. Me and my stomach are very happy about this fact. The lady at the reception is organizing my Visa for Vietnam until tomorrow. Yes, that´s possible. You pay the same price you´d pay when you go on your own. That looks a bit like corruption but who cares? The day after tomorrow I will take the night bus to Siem Reap. So I started a long walk though the city of Phom Penh. This city is full of street food stalls and I will try my best to get 100% well as soon as possible. For me the best way to see all the secret corners of a city is walking. On my way I had a look for the locals and for good street food stalls. I visited the independence memorial that has its place in a nice park in the center of Phom Penh. There are not many skyscrapers in the city and you can see lots of old colonial buildings everywhere. After two hours of walking between the heavy and chaotic traffic I had my first light steet food snack and entered the Tuol Sleng Museum. This museum is a must see place when visiting Cambodia and Phnom Penh. Once this place was a normal school. And from the outside the building still looks like it is one. But when you enter and hear the story and see what happed when the Red Khmer ruled the country you will be shocked. 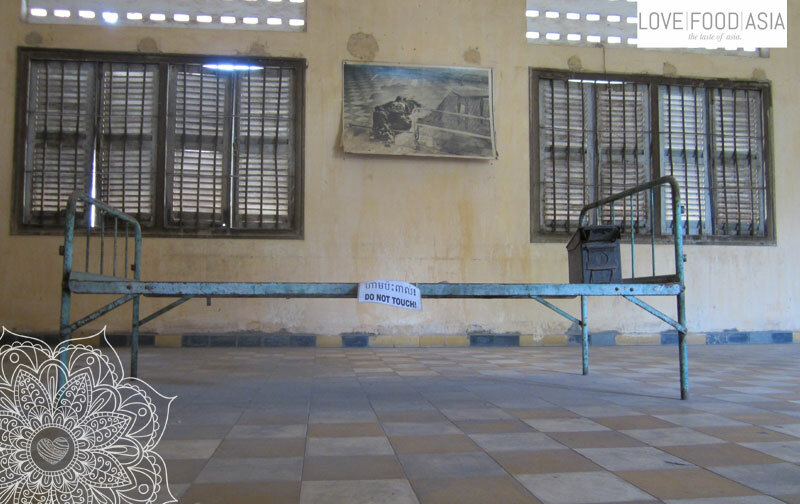 The school became a prison and the Red Khmer tortured all their enemies here. Many people – men, women and children – came to death in this place. When the prisoners survived the torture they where brought to the “Killing Fields” on the outside of Phom Phen. Tomorrow you can read what the Red Khmer did at this place. When I took a seat in the center of the courtyard I thought about how cold a person can be. Pol Pot, the leader of the Red Khmer was this kind of person. It is unbelievable what the Red Khmer did to their own people. I walked back to my hotel to spent the rest of the day in bed. The long walk was to much for my body. Tomorrow I will be fit enough to see the rest of this interesting city.